The numerically small family Bullinidae has colourful shells up to about 20 mm in length, moderately thin and light, with a large aperture and short spire. Shells are white or cream with red, brown or black spiral bands, and are covered with a thin periostracum. There are about 13 species, 11 of which occur in the tropical and subtropical Indo-West Pacific and 2 in the Atlantic Ocean (Poppe, Tagaro & Chino, 2011). Only one species, Bullina lineata, is commonly found in NSW, while two others, B. melior and B. vitrea are of uncertain status. Bullinids are epifaunal animals, in NSW occasionally seen at low tide crawling on algae in rock pools. The animal is as colourful as the shell - usually translucent white with a brightly coloured margin. Their food is sand-dwelling polychaete worms. Family Reference: There is no consolidated reference to the family. Bullina melior (Iredale, 1929) was described from material taken by the dredge Triton from Sydney Harbour. The holotype is like Bullina lineata but larger; Iredale described it as "larger, broader, with a more depressed spire and stronger sculpture". This is probably a fossil dredged from below the bottom of the harbour. 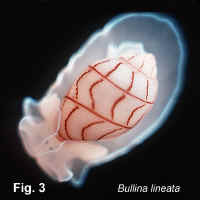 Bullina vitrea Pease, 1860 was reported from northern NSW by Rudman in The Sea Slug Forum at http://www.seaslugforum.net/find/bullvitr . It is also known from Hawaii, New Caledonia, Norfolk Island and New Zealand. In contradiction to Rudman's comments, no Australian specimens could be located in the Australian Museum collection. Identification Notes: Shells are readily placed in this family through the characteristic shape and pattern. The shells of Aplustridae are larger, except for Micromelo undatus which has a similar colour pattern to Bullina but a wider aperture.